When a Labour government swept to power in 1997, it could have restored those rights which had been under attack since the 1970s. Instead it chose to ally itself with corporate tax-shirkers, company bosses, grasping landlords and rich investors, to turn Britain into a paradise for the privileged. Now we have a Coalition intent on breaking open every last part of our public services for private profit, and threatening millions of us with homelessness and destitution. Yet Miliband and Co. just stand on the side-lines or actively cheer it on, because Labour still agrees with every cut, every sell off, and every assault on the rights of working people. 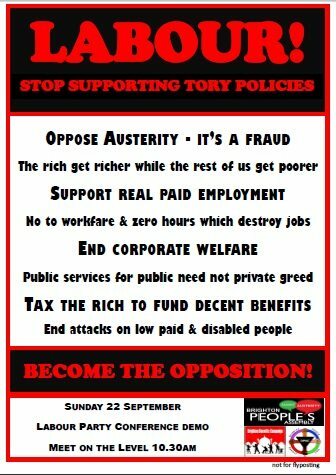 Labour supports cuts in the name of austerity. Despite the fact that the financial crisis was due to the gambling of greedy unregulated bankers and that trillions of pounds was spent on bailing them out, it has been used as an excuse to launch a vicious attack on the public sector. Since the crisis the income of top earners has rocketed while the rest of us face frozen pay, crippled services, and job and housing insecurity. Labour scorns those reliant on benefits. It was Labour that introduced US-style workfare schemes, which it still approves of, and employed Atos to force the sick and disabled off benefits through the iniquitous work capability assessment. No wonder Liam Byrne is promising to help the Tories salvage the shambles of Universal Credit, which is planned to punish all those on low incomes. Labour supports privatisation. Hardly surprising, after all it introduced academy schools, tuition fees, NHS foundation trusts and the Private Finance Initiative. Labour talks of saving the NHS in 2015 – but there won’t be anything left to save. 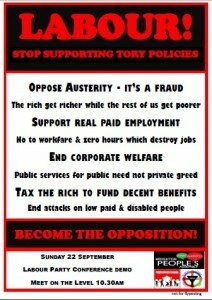 When will Labour stop embracing Tory policies and remember who it is supposed to represent. We already have one major party for the wealthy and privileged, we don’t need another. TIME TO ACT LIKE IT! Fine sentiments with which I entirely agree – but Miliband and the labour right are not going to change a thing. I wish they would all die – because that’s what disabled people are doing – social cleansing that would be deemed illegal anywhere else in the world.